I don't like 3D movies. They hurt my eyes, the bridge of my nose and the top of my ears get sore and I just get generally annoyed with the entire spectacle. I didn't like AVATAR very much for that reason alone. It looked great, but every twenty minutes or so, I had to take the glasses off and rest my eyes for a minute and that lessened my enjoyment of the movie, I think. There are some movies that use it in a way that I enjoy, and those are movies like PIRANHA 3D and A VERY HAROLD AND KUMAR CHRISTMAS. Those movies basically just poked fun at the 3D genre for an hour and twenty minutes and it was over. That kind of thing I can handle, but big epic, sweeping serious movies in 3D I can't. That's what bothered me about HUGO so much. 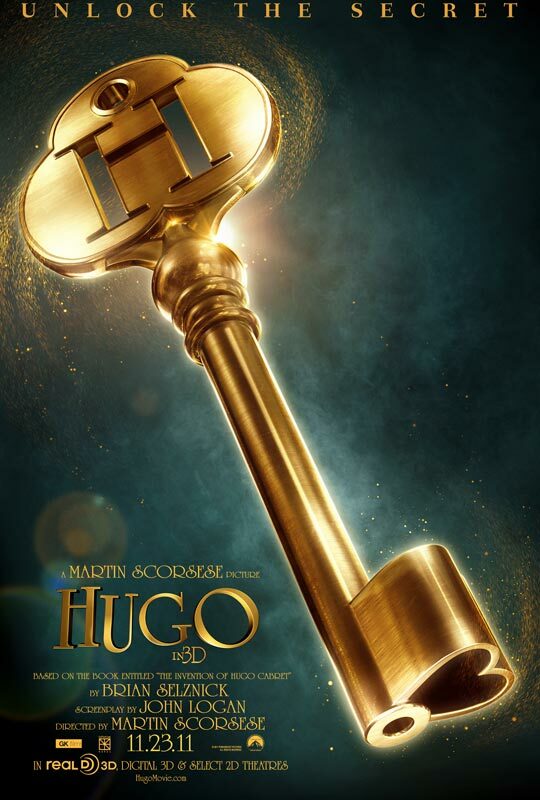 Normally, I love Martin Scorsese movies (with a few exceptions like BRINGING OUT THE DEAD, KUNDUN, THE AGE OF INNOCENCE) and there were aspects of HUGO that I loved, but it had a couple of huge problems that I just couldn't get past. First of all, it didn't need to be 3D. He used it in a great way, but I didn't think it added anything to the story and when it comes on HBO in six months, some of the shot selections are just going to look strange and unnecessary. There were parts that were amazingly well done and the 3D technology was utilized well, but that's all. I just kept thinking about how much more I would have enjoyed it had I not had to keep taking my glasses off. Second, it was too long. At 125 minutes, kids will (and definitely were in the screening I saw) start to get restless. I know it's an adaptation of a kids book (that I've never read), but from what I hear there were a lot of things added to it that extended the running time that maybe didn't need to be there. I don't know that for sure, but it was still too long. That said, every actor in the film did an amazing job and the story is pretty good, but it's more like Martin Scorsese's love letter to film than a family/kids movie. I think that's where it lost a lot of casual viewers and why most critics were so kind to it. There are A LOT of nods and references to the beginning of film, old movies and the growth of cinema. If you've spent years in film classes learning these kinds of things (like I have) or have just seen and are able to appreciate those early films (like most critics), you're in on it and it's fascinating. If you're not in on it, and you have no idea what they're talking about, it doesn't resonate. The people I saw it with, all of whom range in age from 19 up to 33 and have never seen any of the films referenced didn't care much for it. The Film Stage did a nice job the other day of compiling a list of '10 Classic Films You Must Watch Before Seeing Martin Scorsese's HUGO.' It's a great, informative list and there are streaming copies of each film and a little write-up of what they are, what they meant and how they inspired the film. It's a really fascinating piece and if you have any interest in film history, they're all great to watch. But it's also 10 films you need to watch in order to understand the importance of what HUGO is about for Scorsese. That's where the problem is. I guess the bottom line is, if you're a film nerd like me and know what all of the movies on the Film Stage list are, check out HUGO and enjoy Scorsese's love letter to movies, because there's no one that does it better and there are very few filmmakers who have been able to stay at the top of their game for so long—seriously, Scorsese has been consistently great for nearly 40 years. But if you're just an average filmgoer, this might not be for you.